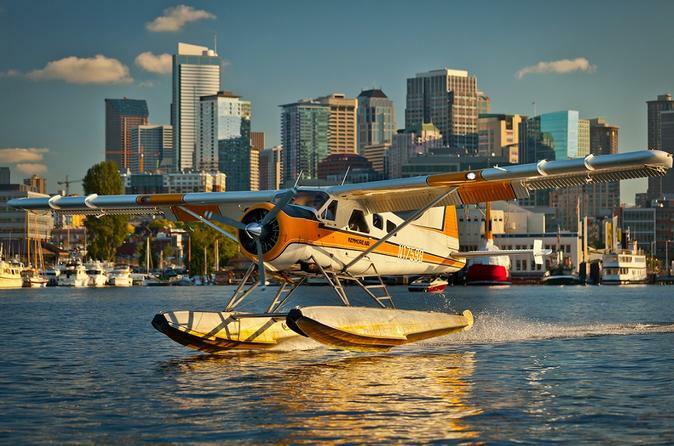 See the sights of Seattle during a 20-minute flight in a 5- or 10-passenger seaplane. Everyone gets a window seat on this flightseeing tour over Seattle’s waterfront areas that provides you with aerial views of the Space Needle, Lake Union, professional sports stadiums and the downtown skyline. Listen to music and recorded commentary about the city, and end with a picture perfect water landing in the heart of the city. Make your own way to Lake Union, located in the heart of Seattle, and board your seaplane for your 20-minute flightseeing tour of this port city, a jewel of the Pacific Northwest. Experience the thrill of a water takeoff, and admire the majestic backdrop of Mt Rainier as you rise into the sky. From your window seat, enjoy bird's-eye views while you listen to music and recorded narration about what you're seeing below. Look down on Lake Union's houseboat communities mixed in with extravagant estates along the lakes and Puget Sound. Flying above central Seattle, focus your camera lens on the University of Washington campus, Seattle's professional sports stadiums, the Space Needle and the downtown skyline on bustling Elliott Bay. Your flight ends with a gentle landing back on Lake Union.